XL Lifesize Rainbow Dash 70 inch / 175 cm long! Click "browse folder" to see more of my handmade plushies. Vendor at Bronycon 2019 - hope to see you there! 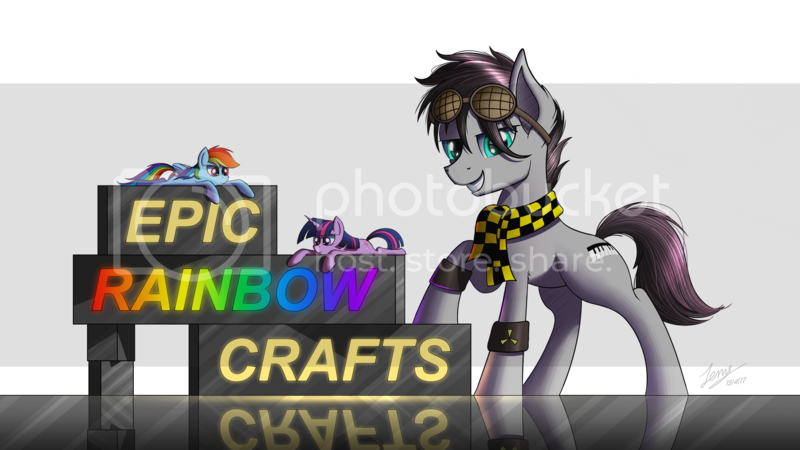 Im Epicrainbowcrafts, also known as ERC. I've been making custom plushies since 2012. It all started with that i became a fan of the new MLP series! It started of as a hobby and quickly grew to both a hobby but also a smaller business! Take a look in my galleries for more of the plushie work ive been making through the years! Comissions are currently closed. However, we may have a spot for 1 or 2 comissions for a upcoming wave before it opens officially! just get in tocuh via deviantart notes / email with any questions or if you'd like to secure a spot for a upcoming comission wave! If you have already got a confirmation that theres a spot for you in the current wave (March) its still open for you! we just dont take any additional ones currently. If you're considering a comission, please also take a moment to read my FAQ & price info link below as it will conatin general price information and some of the more common questions or thoughts aswell as giving you a wide variety of options as of sizes/types of plushies! 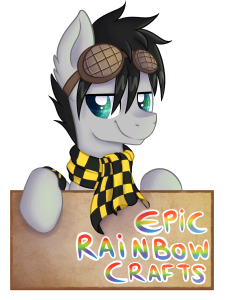 Im Epicrainbowcrafts, also known as ERC. I have been making custom plushies since 2012. It all started with that i became a fan of the new MLP series! Premium materials used - materials of the highest quality is handpicked to guarantee the highest quality plushies. From the fabric to the threads used. Medium soft stuffing - for better cuddle feeling i dont stuff my plushies to firm/hard. you can however request softer stuffing or more firm too, Wichever option you prefer. Payment options - i accept paypal as payment method. In some cases regular bank transfers if requested. some of my previous work can be found in my gallery. All plushies are made using highest quality minky fabric, and faux fur (or minky) for hair. Eyes and cutiemarks are made with machine embroidery. contact me for any further questions! Gif of my OC cyanide is made by Ne-chi to the right and the one to the left is made by Sibsy. Full customisation is possible - if you have an idea for a plushie type or pose not listed here, feel free to send me an email or note here on deviantart! If you are interested in a comission, the first thing you can do is check my price ranges below to get an idea of what size & plushie type suits you best. Once you've decided, send me an email or a deviantart note for a full price quote as this might be different from the guidline prices, especially if its an OC or the pony in question have a hard design, extra accesories etc that is added to the price. Comission waves usually start on the 15th and then overlaps into the following month (ie: 15 March, 15 April, and so forth). Regular plushies has a crafting time of approx 3-6 weeks, and lifesizes & cuddle sized plushies 6-12 weeks from starting date. How long does the crafting process take, once i've ordered? That depends heavily on which plushie you choose. For example a smaller plushie such as a beanie could take 3-7 weeks, while a large lifesize one can take 4-12 weeks approx (this estimate can sometime increase/decrease due to current work load and other factors) And usually increases some in times of convetions (summer time). I offer a google drive link where you can follow your plushies progress, with photos being uploaded as progress is done! If you would need your plushie within a specific timeframe, it is allright to request priority, just let me know upon comissioning ! Only order if you are 100% sure that you want to proceed the comission since refunds for changing your mind mid crafting will not be offered except in very special cases. Payments earned from comissions is often used directly into investing in new materials and machines etc and everything regarding the crafting. Time and material spent is non refundable once started. How do i keep my plushie nice and clean? I get this question alot and for good reason! Once investing a large amount of money into a handmade plushie you'd want to keep it nice and clean right? Regardless if you have it standing on a shelf or bringing it with you! Ive created a little guide on cleaning tips & tricks that you can get by clicking the link below! if you have any questions just let me know as i'll be glad to help you out! Tall : The plush is measured on height, usually done on standing plushies. The pony is measured from the ground up to the top point of the head (ears included). 1. *Regular beanie plush 13-14inch long (or 34 cm) *Princess are more*: 300+$ USD. *All plushies can have beanie stuffing or with regular soft polyester fiber fill! Front legs can be straight or slightly curved (wichever you prefer). Front legs can be straight or slightly curved or straight. Neck can be in an upright position ( as seen on Dash), or more leaned foward, as seen on the Twilight pic! These are just a few examples of the available plushies ive got. Im very open for suggestions if youd wish something different. Feel free to check my gallery for more images of previously comissioned plushies! Design your own plushie Got a special idea for a plushie but its not noted as an example above? 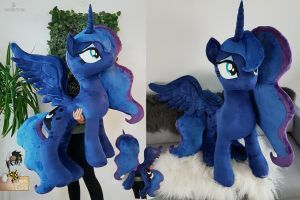 A lifesize plushie, or just a larger plushie? Maybe even another pose or type? Maybe its something completly different than a pony? Just send me a note to get a quote and to see if it is doable. Prices varies completly depending on what you would like. extra accesories such as voiceboxes , hoodies, clothing, poseable plush, poseable wings , and socks etc can be made for your plush but for an additional cost. Plushie FAQ - please read this before comissioning. All prices are in USD (paypal converts the payment so you dont have to actually use USD yourself). I sell & ship worldwide and have fixed shipping costs for all countries. The plushies i make is hand crafted and requires a large amount of work and love to create, and the price reflects that. Materials are handpicked out from the highest quality fabrics and embroidery threads available. I use madeira rayon silk thread for embroidery. Shipping will be from sweden (i ship worldwide), and always include a 1st class tracking number package. Delivery time varies based on country, but usually it typically takes 2 weeks to the US and 5 days within europe. The plushies i make are only made out of handpicked quality materials. The materials i use is called minky fabric, wich is a very expensive plush material. Often used for soft baby blankets, the fabric melts in your hands. The materials are handpicked to guarantee the best quality. This also accounts for extra accesories such as gemstones (for lunas mane for example) / clothing etc. High quality Rayon threads is used for machine embroidery details such as eyes and cutiemarks. I offer a broad amount of different plushie sizes, types and poses. I also gladly design completly new patterns if theres a specific type or style you'd want your plushie in (this increase price though). Just contact me with your idea and i'll see if its doable. I like challenges! If you have decided for a plushie type and size, you can contact me here or nickeatbay@gmail.com , with the details about what you're after. If its an OC, a refference picture is highly appriciated. I work at a rather slow phase as i study fulltime alongside plushie making. Normally it takes me 3-5 weeks to do a comission when i have 2-3 going at the same time. Sometimes this is quicker or a bit slower though. Please take this into consideration before comissioning. If you want your plushie by a specific date for an event or someones birthday , etc or just quicker, its doable, but let me know at the beginning of the comission and i'll try to make it work! Comissions are pre-paid in full before i will start. I accept paypal as payment method. Shipping is always made with 1st class trackable package and i ship worldwide! * Any plush can be altered , smaller/bigger size of any type of pony. Or such as wet mane style, special hairstyles etc. send me a note and i will get back to you with a price idea.